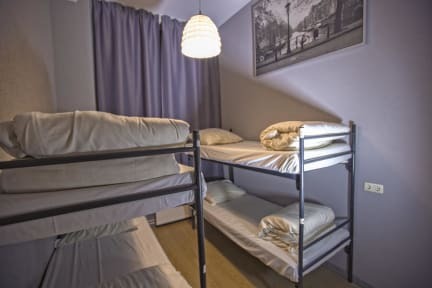 Hostel Cosmos Amsterdam i Amsterdam, Nederland: Bestill nå! Thank you for choosing Hostel Cosmos Amsterdam! Our hostel is located in the most central area of Amsterdam, just walking distance to The Van Gogh museum,Rijks museum,I Amsterdam sign,Concert building,Vondel park. All you need is just minutes away and the city's hotspots are all walkable from here. Save money since you don't need to pay for transportation when you stay with us! Hostel Cosmos Amsterdam is a cool little youth hostel. The friendly atmosphere and generous hospitality have drawn guests back to our hostel over and over again. We're also more than happy to assist you with your day trips, pointing out the highlights of the city and help you out in finding your way in Amsterdam. Our hostel is also the permanent residence of Simba, the house cat. Any guest who may be allergic to cats should be mindful of this before booking their stay with us. We are looking forward to welcoming you to Amsterdam and the Hostel Cosmos Amsterdam! We choose to have a more laid-back and personal atmosphere and therefore we advise to please contact us for bookings of six people or more. We also don’t permit persons under 18 years of age or above 40, pets, any bookings of stag nights, hen nights or sport tours, soccer fans for (inter)national matches. In order for us to guarantee your booking and to make sure we are not handling a false booking, we need to pre-authorise the amount equal to the first of every booking after receiving the reservation. The pre-authorised amount will be released back to your account after your departure date. Cancellations and/or modifications can be made free of charge until 7 days prior to your arrival date (not arrival time). During the 7 days before your arrival we will charge the full amount of your reservation to the provided credit card. This payment will then become 100% NON-REFUNDABLE. Read the above carefully because in the event of a false booking, there will be no check in nor will there be a refund.